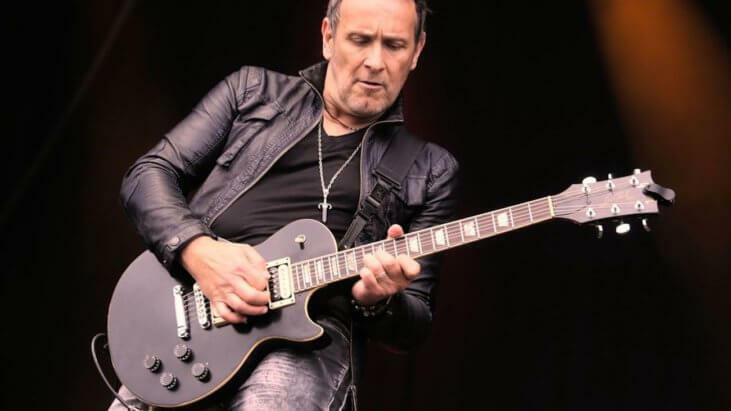 With an attitude true to his heavy metal roots Def Leppard guitarist Vivian Campbell recently said he’s doing amazingly well in his battle against Hodgkin’s lymphoma — which he was diagnosed with in 2013 — and he plans to continue rocking regardless of his diagnosis. The Irish guitarist also mentioned that he’d like to give cancer a big F-you and keep on doing what he does best. In a new interview with City of Hope, Campbell — who has been playing with Def Leppard since 1992 — said that he feels very fortunate that he was able to find a drug that worked so well on his cancer, and he has no plans to slow down when it comes to his career. Campbell is taking a relatively new drug called Keytruda — a type of immunotherapy that has shown incredible results when it comes to treating several cancers. Keytruda works by helping the immune system to attack and destroy cancer. The drug has brought hope to cancer survivors all over the world — but unfortunately, it doesn’t work for everyone. “Keytruda is not for everybody; you may need more than that; you may need less than that,” Dr. Anna Pavlick, a medical oncologist at NYU Perlmutter Cancer Center, told SurvivorNet when discussing immunotherapy in general. “Getting to know the patient, getting to know their history, getting to know where their disease is and how quickly their disease is moving.” There are a whole host of factors to consider. In Campbell’s case — the immunotherapy seems to be working. Initially, Campbell was treated with rounds of chemotherapy and even a stem cell transplant as doctors worked to fight his Hodgkin’s lymphoma — a type of blood cancer — but that wasn’t working. So Campbell worked with his doctor to devise a plan that would work better for him — and it turned out that was immunotherapy. “I consider myself very, very fortunate that I’ve been able to find this treatment that I’ve responded to so well,” Campbell told City of Hope. Keytruda (or pembrolizumab) was only approved as a treatment for Hodgkin’s lymphoma in March 2017. However, Campbell participated in a clinical trial — so he actually began treatments in 2015. Now, he receives infusions roughly once a month — and the drugs have kept his cancer at bay for almost four years while he continues to tour with the band.